If you love the classic look of an old-world styled map, but prefer a design with a more modern look and up-to-date detail, then our 3-Panel Vintage-Style Travel Map is the map for you! This gallery wrapped canvas map is simple, yet sophisticated and is printed on premium canvas to give it a rich texture that makes the map look like a true work of interactive art. The neutral, antique color palette and contemporary 3-panel frameless map design ensures it will match just about any décor. Use your map to track past travels and plan future vacations. The extra-large size of this 3-panel vintage map gives you bigger font sizes and more surface area to pin. Makes a fun gift idea for that person in your life who spends their days daydreaming about their next big adventure. By adding one of our 6 unique personalization options, you can create a special, memorable gift for just about any occasion. But be warned! 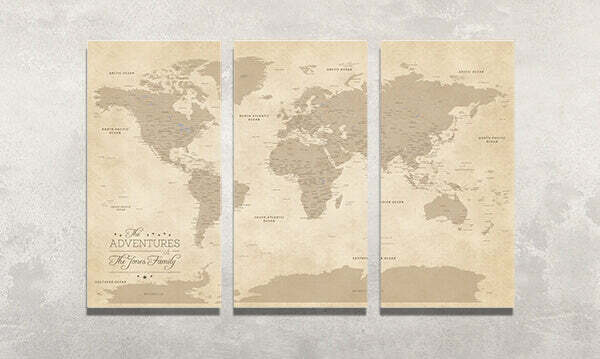 Displaying this map in your home or office may cause a serious case of wanderlust!